Southfield Director of Planning Terry Croad (L) and University Architect Joseph Veryser discuss the details of the gateway plaza construction project near the Civic Center Drive entrance to Lawrence Tech’s campus. A new landscaped gateway plaza at the intersection of Civic Center Drive and the Northwestern Highway service drive on the north end of Lawrence Technological University’s campus is part of a plan to increase pedestrian and bicycle traffic between the University and Southfield’s commercial district. The Southfield City Centre Advisory Board has unveiled ambitious plans for the City Centre district that will create a pedestrian-friendly, mixed-use environment for the area bounded by Evergreen Road, Northwestern Highway, and I-696. The Southfield municipal complex and the Lawrence Tech campus are considered part of the new City Centre. The south side of Civic Center Drive is currently designated as a bike route. Southfield Director of Planning Terry Croad wants to improve the bike route from the Lawrence Tech campus to the municipal center complex on Evergreen Road. In addition, a major part of the project is to make the four corners of the Northwestern Highway intersection more visually appealing. The new gateway plaza on Lawrence Tech property is the first phase. “Hopefully, LTU’s gateway demonstration project will encourage other property owners to work with us in the future,” Croad said. The project has an estimated price tag of $80,000, and the City Centre is providing matching funds for pathways, landscaping and benches. University Architect Joseph Veryser has coordinated the construction work with the plans for the new district. The project also gives the University the opportunity to replace an outdated sign with the University’s updated logo. “Civic Center Drive has always been considered the back entrance to the campus, and we want to make it more attractive,” Veryser said. There is a plan to extend a bike path and sidewalk down to Ten Mile Road, which would increase student access to Southfield merchants, restaurants and other services. That fits in well with the University’s plans for new residential housing and a new academic building for engineering, architecture and life sciences. Lawrence Technological University, www.ltu.edu, was founded in 1932. Bloomberg BusinessWeek lists Lawrence Tech among the nation’s upper third of universities for return on undergraduate tuition investment, and highest in the Detroit metropolitan area. 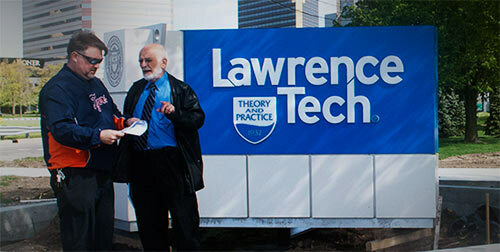 Lawrence Tech is also listed in the top tier of Midwestern universities by U.S. News and World Report and the Princeton Review. Students benefit from small class sizes and experienced faculty who provide a real-world, hands-on, “theory and practice” education with an emphasis on leadership. Activities on Lawrence Tech’s 102-acre campus include over 60 student clubs and organizations and a growing roster of NAIA varsity sports.